Designed by Peter Newland. Published by Mind the Gap Studios. Coming in 2015. For 3-10+ players that can speak and laugh. Plays in 15-30 minutes. Copy provided by publisher. So you find yourself sitting at a table surrounded by zombies. No, don't question it, just play along, because that's the only way you're going to survive. You have to become one of them. Be the zombie. Think zombie. Talk zombie. That's what ZtoZ is about. It's a crazy little party game with a premise that appeals to most people: Act like a dork to make your friends laugh. 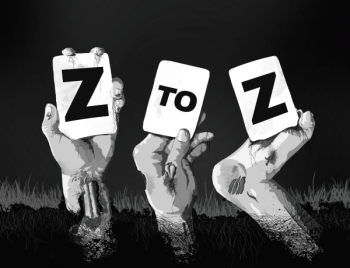 Each turn, a player looks into the eyes of the person on their left and reads the word on their card in their best zombie impersonation possible - words as diverse as watermelon, Barbara, gravy, armpit, and sad clown. If the other player giggles, laughs, snickers, or smiles for too long at your silliness, they're out of the game. The last player not laughing takes the crown of zombie-est zombie impersonator and survives. The others are messily devoured. This game is packed with goofiness and baked into a delicious crust off silly fun. There's not much that can go wrong here: It has all the fun elements of party gaming and isn't so complicated that you'll get off the rails or bog down the game even for a moment - though goofy moments tend to call up anecdotes that will have everyone cackling. Looking a friend right in the face and growling out "yodelayheeooo" in your best zombie voice is guaranteed to make somebody at the table giggle. That said, you'll be left with the conclusion sometimes that there' s not much of a game here. It's more like a printed version of a folk game like Celebrity than it is a fleshed out, ironclad tabletop game. There could really be a lot more substance - ways to challenge other players, or manipulate how they have to say their words, would add more of a game to this without weighing it down too much. However, there's a certain speed to the game that's nice. You sit down and play in moments, and in the right environments, where players have had a few drinks or are feeling giddy, it's a game that'll shine. At its price, it's less than a movie ticket, and will certainly provide more enjoyment for that money even if you play it a few times and never again. ZtoZ is funding now on Kickstarter. Bottom Line: A goofy party game, it'll get more mileage with younger crowds than with grown farts. Recommendation: If you're looking for a goofball party game with a low cost of admission, here's your game.